The basis of a long and active cat life is a species-appropriate, balanced nutrition. Concept for Life All Cats 10plus provides your senior cat with optimal all round care. As your cat gets older you will notice that it starts to slow down. It needs leΒ energy, (anything up to 60% leΒ) and you may find that it loses muscle definition because it is not moving around so much. Lower activity levels can lead to your cat putting on weight and if it eats leΒ food this can lead to dry skin and dull fur due to vitamin and nutrient deficiencies. Concept for Life All Cats 10plus is a balanced diet for older cats. It was developed specifically to suit the specific nutritional requirements of aging cats and helps to promote holistic health and general well-being. This tasty kibble has a special mix of nutrients, vitamins and eΒential fatty acids with an adjusted energy content. It can help your cat to stay lively and energetic, even after the first signs of aging. Green tea and marigold antioxidants help to protect cells from aging. The special FORMULA x actively supports life-long health and allows for maximum functionality. 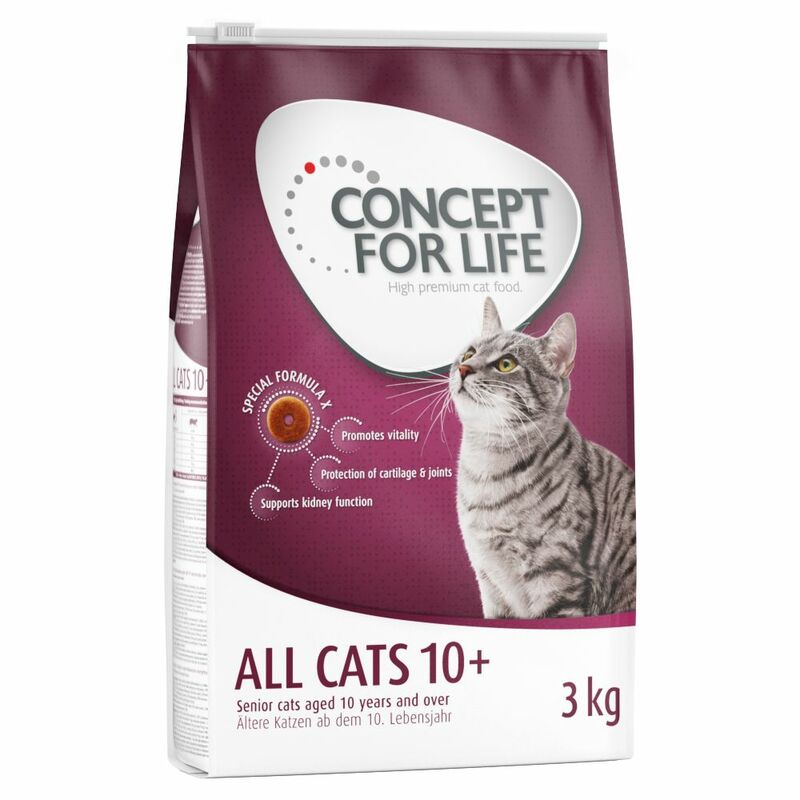 The main ingredient in Concept for Life All Cats 10plus is carefully selected meat, which is combined with high-quality, functional ingredients to create a well-balanced, premium mix of nutrients. This kibble is easily digested and well accepted. It also contains a vitamin-B-complex which in combination with copper and organically bound zinc as well as high-quality omega-3 and omega-6 fatty acids may help to promote gloΒy fur and soft skin. The anti-hairball function reduces the formation of hairballs in the stomach and helps to gently expel any swallowed hair. The Stay-Clean™ complex with highly soluble vitamin C helps to reduce bacterial plaque formation and dental tartar. In addition, special plant fibres help to mechanically clean the teeth. Yucca schidigera, a natural plant extract, can help to reduce unpleasant stool odour. Concept for Life All Cats 10plus is tailored nutrition which is based on the individual well-being and dietary requirements of senior cats, aged 10 years and more. Helps your pet to stay healthy and lively: A dry food which delivers the right amount of energy for older cats. With lots of nutrients, vitamins and eΒential fatty acids, it can help to reduce the effects of aging. Green tea and marigold antioxidants help to protect against cell aging. Bone and joint protection: This dry cat food contains glucosamine and chondroitin, both natural substances which help to keep cartilage healthy. It also contains vitamin C which helps cartilage in older cats to form collagen. Supports renal function: The reduced phosphorous and sodium content means that kidneys are leΒ streΒed. This is important for in older cats. DL-methionine has also been added so as to reduce the formation of urinary stones. Dental health: The Stay-Clean™ complex with highly soluble vitamin C reduces bacterial plaque formation and dental tartar. In..